Construction has started on a new transit center near the Three Trails Crossing that will share in a slice of U.S. history. The KCATA’s new transit center on Blue Ridge Boulevard near Bannister Road has been designated by the National Park Service as a trailhead marking the California, Oregon and Santa Fe trails. When the transit center is completed later this year, the park service will install an official marker commemorating the role the three trails played in westward expansion. 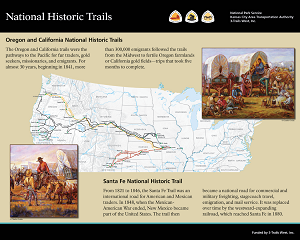 Additionally, the park service is designing and custom manufacturing panels with images illustrating the historical significance of the trails. Orientation murals explaining the trails’ place in history also will be installed at the stop. The park service will provide the historical amenities for the station. The Three Trails Community Improvement District enlisted the artist to develop the murals for the transit stop and has played a key role in its development. The transit station is under construction near the northeast corner of Bannister Road and Blue Ridge Boulevard where Interstate 435, Interstate 470, U.S. 71 and Interstate 49 converge at the point known as the Three Trails Crossing. The new transit center’s features will include bike racks, real-time bus arrival signs, shelters, parking, lighting and accessible ramps for riders with disabilities. It is expected the new stop will be completed late this summer. Engineers say the new transit stop will allow bus riders to connect to popular locations in the region. It will serve as a hub for six routes, including the Troost MAX, 28 Blue Ridge, 28X Blue Ridge Express and 75 75th Street. Here's an example of the historical mural that will be placed at the new Three Trails Transit Center that's now under construction. The KCATA’s new station figures into the National Park Service’s plan to develop a 40-mile interpretive trail retracing the path of the California, Santa Fe and Oregon trails through the Kansas City area from Sugar Creek, Mo. to Gardner, Kan. The trail would feature signs and markers explaining the trails’ historical significance. The development plan calls for the interpretive trail to identify all nearby transit facilities that could serve as trailheads with signage and exhibit panels distinguishing these stations similar to the one at the Three Trails Crossing interchange. Planners at the Mid-America Regional Council will collaborate with local officials and key stakeholders to identify a preferred alignment for the trail and develop signage and markers to guide people along the historic path west.